We reuse this stuff for a variety of cases where the data behaves similarly and I suspect that you will be able to apply this to a bunch of your monitoring targets as well. Almost always something broke or choked. [*] Note that some regular patterns can look like this as well. For example weekend traffic lower than weekdays, etc. We see this a lot. The illustrations don't portray this for simplicity. But the alerting logic below supports this just fine by comparing to same day last week instead of yesterday, etc. We can then leverage this for various use cases, as long as the expectations of the data are as outlined above. We use this for web traffic, volume of log messages, uploads, telemetry traffic, etc. For each case we simply define the graphite queries and some parameters and leverage the existing mentioned Bosun and Grafana configuration. If any, or multiple of these conditions are in warning or critical state, we get 1 alert that gives us all the information we need. It shows the current past week as red dots, and the past weeks before that as timeshifts in various shades of blue representing the age of the data. (darker is older). Note: I Won't explain the details of the bosun configuration. Familiarity with bosun is assumed. The bosun documentation is pretty complete. Gist with bosun macro, template, example use, and Grafana dashboard definition. Load the bosun stuff in your bosun.conf and import the dashboard in Grafana. The alert is where we define the graphite queries, the name of the dimension segregated by (used in template), how long the periods are, what the various thresholds are and the expressions to be fed into Grafana and Graph-Explorer. It also lets you set an importance which controls the sorting of the segregated entries in the notification (see screenshot). By default it is based on the historical median of the values but you could override this. For example for a particular alert we maintain a lookup table with custom importance values. dm-load loads all the initial data based on your queries and computes a bunch of the numbers. dm-logic does some final computations and evaluates the warning and critical state expressions. They are split so that your alerting rule can leverage the returned tags from the queries in dm-load to use a lookup table to set the importance variable or other thresholds, such as s_min_med_diff on a case-by-case basis, before calling dm-logic. We warn if one or more segregated items didn't meet their median requirements, and if erraticness exceeds its threshold (note that the latter can be disabled). Critical is when more than the specified number of segregated items didn't meet their median requirements, the global volume didn't meet the strength ratio, or if erraticness is enabled and above the critical threshold. Accounts for difference in volume: for example if traffic at any point is much higher, we can also expect the deviation to be higher. With the previous formula we would have cases where in the past the numbers were very low, and naturally the deviation then was low and not a reasonable standard to be held against when traffic is higher, resulting in trigger happy alerting with false positives. While this has been very helpful to us, I want to highlight a few things that could be improved. 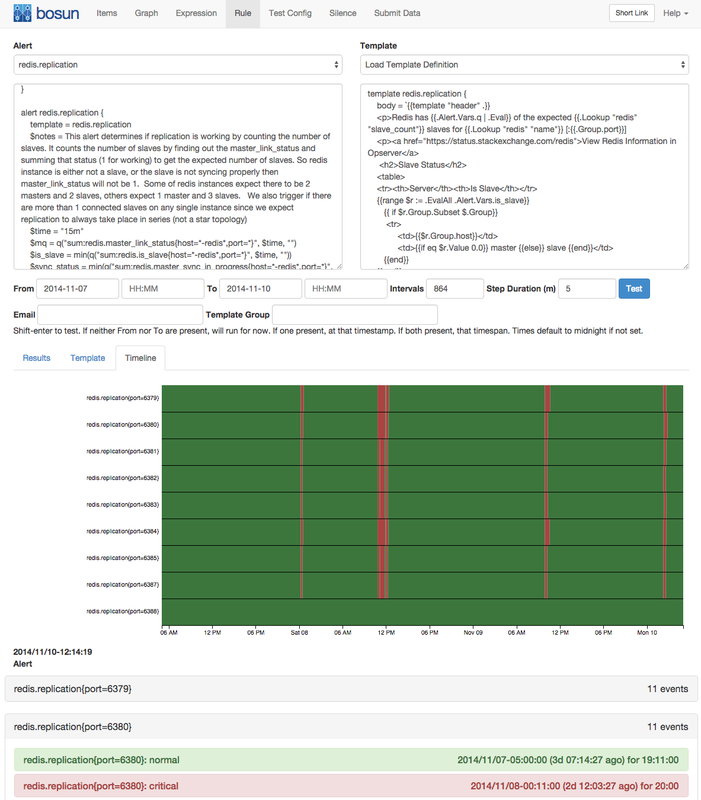 routinely building a knowledge base of time ranges annotated with a given state for a given alerting concern, which would help in validating the generated status timeline, both visually and in code. We could compute percentage of issues found, missed, etc. "unit tests for alerting" my boss called it. Template could be prettier. In particular the plots often don't render very well. We're looking into closer Grafana-Bosun integration so I think that will be resolved at some point. See that drop in the screenshot a bit higher up? That one was preceded by a code deploy event in anthracite which made some changes where a drop in traffic was actually expected. Would love to be able to mark stuff like this in deploys (like putting in the commit message something like "expect 20-50 drop" and have the monitoring system leverage that. As I explained in the previous article I fondly believe that the commonly cited solutions (anomaly detection via machine learning) are a very difficult endeavor and results can be achieved much quicker and simpler. While this only focuses on one class of timeseries (it won't work on diskspace metrics for example) I found this class to be in the most dire need of better fault detection. Hopefully this is useful to you. Good luck and let me know how it goes!